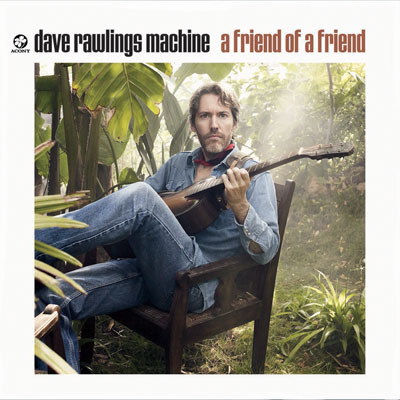 Dave Rawlings has been around the block a few times. The Gillian Welch guitarist and partner in song has also co-penned tracks for rootsy rockers Ryan Adams, Bright Eyes and Old Crow Medicine Show, but this is his first time stepping into the solo spotlight. A Friend of a Friend, complete with plenty of Welch collaborations as well as alternate, more Rawlings-heavy versions of tunes he so graciously offered to others, paints the portrait of a creative collaborator in the truest sense, one who has no problem drifting in the background so long as the song is at its best. The real beauty of this album, however, is that Rawlings is forced—raspy, Dylan-esque tenor and all—to the front in a way he has never been before, taking the lead while those whose backgrounds he once called home (Welch, Bright Eyes, Old Crow Medicine Show) now provide a backdrop in front of which he can shine. The result is a mixed bag of new takes on classic bluegrass and other songs that might as well be so. A standout track is a ten-minute cover that merges Bright Eyes’ “Method Acting” with Neil Young’s “Cortez the Killer” in a way that would make a first time listener to either song believe one must have been written with the other. “To Be Young (Is to Be High, Is to Be Sad),” originally a co-written track for Ryan Adam’s 2000 album Heartbreaker, takes on a more jovial tone with the help of Old Crow. Though much of the album is focused on Rawlings’ work with others, his originality inevitably shines through, leaving listeners wondering what great things would come if he were left to his own devices a little longer.